New-look October issue on sale today! | What Hi-Fi? New-look October issue on sale today! "Informed by a ton of research (and having paid close attention to the feedback we get on the forums), we began with a simple mantra – ‘more and better buying advice'," says What Hi-Fi? Sound and Vision Editor Dominic Dawes. "Over the early, frantic weeks of re-thinking the magazine, this became distilled into a single word: ‘more'." There's more of everything: more words in each review; more depth and context to buying advice; more analysis and opinion in the News stories; more insight into product design and new tech; more jargon explained; more system-matching options; and more stylish photography and design. Oh, and some new fonts. You can read all about the redesign, and the extra sections we've added, in Dom's redesign blog. 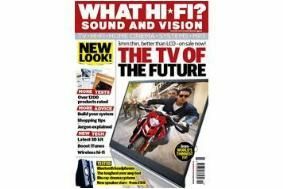 As for content, the magazine's packed – as ever – with exclusive reviews of all the latest hi-tech hi-fi and home cinema kit. We've a Supertest of 40-42in TVs, Group Tests of 3D-enabled, sub-£500 home cinema amps, budget hi-fi speakers under £300 and 2.1 Blu-ray in a box systems. Roundups of Bluetooth headphones and HDMI cables provide an instant system upgrade, and if you're thinking of buying a 3D TV then don't miss our essential Jargon Buster. We've also picked the best kit for your bedroom. Exclusive First Tests abound, with our initial verdict on Sony's BDV-E370 Blu-ray in a box system, Humax's HDR-FOX T2 Freeview HD PVR, Pioneer's VSX-LX53 AV receiver, Audiolab's 8200CD, a £100 Blu-ray player from Toshiba, another Freeview HD box from Sharp, Mission's mighty MX1 £150 speakers, and Arcam's appealing rDAC. Want to know what's going on in the world of high-definition TV? Then don't miss out on our new Insider section of news and analysis. And in Savvy Shopper we help one of our Forum regulars upgrade his Blu-ray player. This month's Big Question tackles the issue: "How much should I spend on a DAC to improve iTunes?" Three readers decide. While our new System Builder gives you all the options for building a complete home cinema system around a Sony BDP-S570 Blu-ray player. If all that wasn't enough to excite you, then this month's competition prize is a belter: we're giving away a Naim UnitiSystem worth nearly £5500, complete with Naim Uniti, UnitiQute and UnitiServe. Head on over to our competition page to enter. All this and much, much more is in the new-look issue of What Hi-Fi? Sound and Vision, on sale today. Don't miss it!